We were up by 7 AM, anticipating our departure from Jetty Park and the Cape Canaveral / Cocoa Beach area of Florida. Around 9:30 AM we started straightening up the interior of our motorcoach. At 10:15 I moved the car over by the office and walked back to our site. Around 10:30 I disconnected the shorepower cord and stored it for travel. With the chassis batteries connected, and the engine compartment accessory air supply open, the engine started right up. After the chassis aired up I raised the tag axle and Linda served as spotter while I eased out of site #357. I thought I might need to back up to get clear of vehicles and trees but I was able to exit the site in one smooth forward motion. Linda got onboard and we drove clockwise around Red Knot Circle and over to the dump station by the office. There is a large paved area around the dump station with room to temporarily park the bus, without blocking any of the vehicles parked there, while we connected the car for towing. We checked the lights, which were OK, and Linda got onboard. We pulled out of the campground just after 11 AM and once I cleared the turn out of the campground exit I lowered the tag axle. I felt a sudden jerk but thought the transmission had shifted. We headed west on George J. King Blvd. and merged onto FL-A1A westbound. FL-A1A quickly crossed the Banana River, leaving Cape Canaveral for Merritt Island. We eventually crossed the Indian River and were back on the mainland. Somewhere along the way FL-A1A became FL-528 which eventually became FL-528 Toll Road. Linda was keeping tabs on the temperatures and pressures of all the wheels/tires. The driver side tag seemed to be running consistent with the others and we settled in for our trip. FL-528 traverses a large swath of undeveloped land with lots of water and birds. Traffic was light and the driving was easy so it came as quite a jolt when we got a high temperature alarm on the driver side tag axle tire sensor. The temperature was in the 160’s and climbing and I started looking for a safe place to pull off the road. Before I could do that I checked the driver side rear view mirror, and saw smoke coming from the tag axle wheel well. NOT GOOD! I pulled off at an entrance ramp to get farther away from the traffic lanes. I told Linda to get our cats into their carriers and grab our computers from the bed in case we had to abandon ship. While she did that I grabbed the fire extinguisher from behind the driver’s seat and ran back to the smoking tag axle. I discharged the extinguisher through the small holes in the wheel in an attempt to cool off the disc brake caliper and rotor. I got the wheel to quit smoking and went back inside to get the other fire extinguisher, just in case. I left the engine running and started trying to figure out what to do. 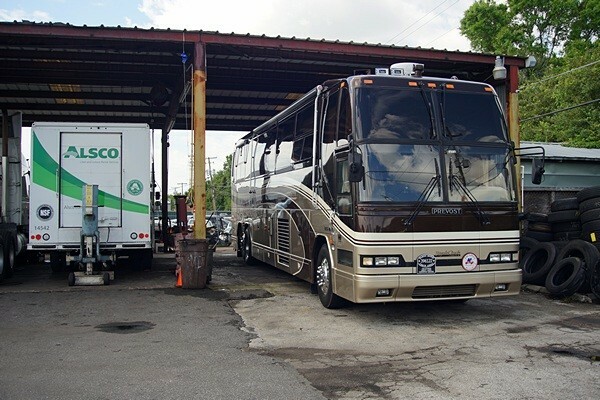 My first call was to the Prevost Service Center in Jacksonville, Florida. They could not help me directly, and their mobile service guy was off today, but the service manager gave me the name of someone to call in the Orlando area. Long-story-short, I ended up getting passed off to a whole string of people, none of whom could help me but each of whom tried to connect me to someone who could. No one could provide assistance in-situ and most places would not be able to help us for 1 to 2 weeks, if at all. I talked to a guy in Cocoa, about 20 miles back the wrong way, who sounded like he could help in a week if we could get the bus there. I eventually talked to our mobile mechanic, Joe Cannarozzi, who was in Michigan working on a coach near Lansing about 30 miles from our house. I also called the Prevost Action Service System (PASS). The Jacksonville service manager was not willing to tell me it was OK to lift the tag axle and drive on six tires but the P.A.S.S. technician thought it would OK as long as I did not drive too far and kept my speed down. I eventually talked to Barry at JOSAM in Orlando, who could not help us directly but seemed genuinely concerned about our situation. Barry ultimately put me in touch with John at Action Mobile Service on the south side of Orlando. Both business were located near the intersection of the FL-528 Toll Road and FL-91 (Florida’s Turnpike). That intersection was about 15 miles from where we were sitting on the side of the road. The consensus opinion was that I should be able to complete the relatively short trip of 15 miles by lifting the tag axle and limiting my speed. By the time I pulled back into the flow of traffic we had been on the side of the road for two hours and were more than a little bit rattled and frustrated. Limiting my speed on a limited access highway posted at 70 MPH was not without its own risks, but it was (apparently) our only alternative unless we wanted to be put on a “low boy” and towed. The sooner we got off FL-528 and into someone’s service yard the better. Traffic was now thicker as it was 1:30 PM but I finally had an opening that was long enough to allow me to get up to 45 MPH without cutting someone off and give other vehicles plenty of time and distance to move over and go around me. I kept my speed at 45 to 50 MPH, except where posted lower in a construction zone, of course, and kept my emergency flashers on the whole way. We exited FL-528 at Exit 4. When I started driving I was headed for JOSAM and Barry had given me a ‘heads up’ about how to navigate Exit 4 as this exit serves a dual purpose. Staying to the right it immediately becomes an entrance ramp to FL-91 (Florida’s Turnpike) whereas staying left and going straight to the stop sign gets you to a side street that leads to FL-441 / Orange Blossom Trail to the right or to JOSAM to the left. We were nearing Exit 4 when Barry called back and told us to go to Action Mobile Service. Exit 4 was also the correct exit for Action Mobile but in the opposite direction from JOSAM. It was at this point that we had a bit of confusion. We were both already pretty frazzled by the events of the last few hours and the last minute change in directions did not make things better, especially with Linda handling the phone call and unable to hear well. We had JOSAM’s address programmed into the Rand-McNally TripMaker RVND 7710 GPS, but that was no longer our destination. Linda tried to enter the address of Action Mobile Service into the unit but it had become non-responsive. I checked the power adapter and saw that the light was out so I knew the unit was not getting 12 VDC power and the battery had probably run down. The adapter often works loose so I plugged it back in but it did not restore the power. The two bottom outlets share a circuit and the two upper outlets share a different circuit so I plugged the adapter into one of the upper outlets. I quickly determined that all four of the 12 VDC accessory outlets appeared to be dead and told Linda to stop trying to use the GPS. She put the address in her phone instead but was having trouble with that as well and was slightly disoriented by this point. I knew we had turn right at the stop sign because Action Mobile was “in the opposite direction from JOSAM.” I also knew I needed to get onto Orange Blossom Trail, but was unclear as to just where that was or which way we needed to turn when I found it. As it turned out I could see a street sign that indicated OBT was the cross street at the traffic signal immediately after we turned right at the stop sign. We were where we needed to be, but now which way to go? On a hunch, when the light turned green, I turned right and headed south. Linda got oriented relative to the GPS/mapping information on her phone and eventually confirmed that we were closing the distance between our current location and destination and thus going in the correct direction on the correct road. I turned left onto the Central Florida Parkway and then a short distance later turned right onto Satellite Blvd. Action Mobile was the second business on the right but I pulled up along the curb, making sure I did block any driveways, and walked in to confirm that we were in the right place and find out where they wanted me to put the bus. We were met by the Service Manager, John Provo, who pointed me to an open area where I could back the bus in and be out of the way. We unhooked the car and Linda drove it into the yard and parked it near where the bus would end up. I then swung the bus out into the oncoming traffic lane and made a hard right turn through the gate and into the yard. (The tag axle was already up, of course.) I pulled forward and then backed in towards the passenger side with Linda spotting for me. I put the tag axle down so the drive axle would not have to support the entire weight of the rear end and checked for level. We were level enough for comfort so I did not bother with leveling. Once we were parked I went in to talk to John (the service manager, the owner’s name is also John). He and I looked at the driver side tag wheel/tire and I described what had happened. Other than the yellow powder from the fire extinguisher there was no visible evidence of what had transpired. Owner John Douglass was outside talking to someone and Linda ended up talking to him. In the course of their conversation she found out that his parents owned a house on Runnymeade in the same subdivision where we lived for 35 years. Not only that, they were there when we were, and John lived with them for a while after trade school (diesel mechanics). He eventually bought the house from them, again, all while we were there but we did not recall ever meeting. It really is a small world, after all! John D. (the owner) introduced us to Bill (the mechanic) who would be handling our repair first thing tomorrow morning. There wasn’t much else to do at that point except to get comfortable, have a late lunch snack, and check in with “Smitty” (John Smith) at Williston Crossings, Pat/Vickie, Butch, and Chuck while Linda updated our children on the status of our situation. The last employees left around 5 PM and closed/chained the gate. We had the code for the lock but the lock was on the outside of the fence. An employee returned around 6 PM so when he left I went out and put the lock on the inside. It did not occur to me at the time that employees might have to get in at all hours for emergency road service calls, but I was willing to get up and unlock at whatever hour if needed. It would be a while until our evening TV programs came on, and we still had plenty of daylight, so I got out my multi-meter to try and diagnose what had happened with the power supply to the four 12 VDC accessory outlets I wired up for powering portable accessories in the cockpit. The 12 VDC distribution/fuse panel seemed like the obvious place to start. The 12 VDC distribution/fuse panel is above the entry stairs from the cockpit landing up to the main floor. It’s an enclosure that is installed against the ceiling and is about 10″ high. It is in-between the TV box (DS) and the front A-C box (PS) and is about 28″ wide. It has a door that is 7″ tall by 24″ wide and hinged at the top, opening out from the bottom. When the door is open the actual opening is, of course, a bit smaller. The hinges on the door do not hold the door open against the ceiling, so one of the challenges working in this space is keeping the door up and out of the way. When working alone I usually prop it open but with Linda helping me she was able to hold it open with one hand and hold the multi-meter with the other hand while I handled the probes. The other challenge is that it is above the stairs and just high enough that I cannot reach it easily without standing on a stool, which is what I did while Linda stood with her right foot on the navigator seat and her left foot on the main floor. It was probably a strange sight if anyone noticed. Each circuit has have a number tag on the wire where it connects to the fuse block terminal. We are fortunate that one of the pieces of documentation we got with the coach lists all of these circuits in numerical order with a description of what it feeds. I recalled (vaguely?) that I had disabled and/removed some devices a while ago and repurposed the circuits to supply power to the auxiliary outlets. I found the circuit numbers and checked those and they did not have power. I traced the problem back to a relay that did not seem to be operating correctly. I carry spare relays and was going to replace it but discovered, after great difficulty removing the relay from its socket, that my spare relays were slightly different (4-pin instead of 5-pin). I spent some time considering whether I could use a 4-pin relay, or perhaps just install a jumper wire to bypass it, when I realized that there were a few duplicate wire numbers, and that those duplicates were the very numbers with which I was working. I checked for 12 VDC on those duplicate circuits and guess what? No voltage there either. I pulled one of the automotive style blade fuses and it was open. I got the parts box with the spare fuses from the car and found a correct replacement. I checked the other two fuses and they were also open. They were very small, 2 and 3 A respectively, and I replaced them with 5 A fuses. After reconnecting a wire (that I had already forgotten I disconnected at the beginning of this process) we finally had power restored to all four outlets, which, as I mentioned earlier, get their power from two different circuits, one for the upper pair and a different one for the lower pair. We spent the night in Action Mobile’s yard. Located in a light industrial area just off a major commercial thoroughfare, it was certainly not an RV park, but it was fenced, with barbed wire on top, had a locked gate (for which we had the code), and lots of security cameras. Satellite Blvd. was surprisingly busy for a side street, with lots of trucks of all sizes and some hot rodders with booming car audio systems. There was a large food processing plant directly across the street that was brightly illuminated and obviously in production 24 hours a day as there were lots of cars/trucks that left around 7 PM and a larger number that showed up at the same time and parked all along the building. We had been running on inverters all day and I wanted to make sure the batteries were close to fully charged before we went to bed so I turned on the genset around 7 PM while we watched TV and tried to relax. I used TVFool.com to locate OTA TV transmitter antennas. Given that we were on the south edge of Orlando the towers were, not surprisingly, in all directions. Most of the strongest stations, however, were lined up to our northeast so I pointed the front TV antenna in that direction. We were able to pick up one of the PBS affiliates and watched a fascinating program of the Vikings; their journeys and reach, and the use of satellite imaging technology to identify possible archeological sites in what is now the Canadian Maritimes. We had to be up at 5 AM so we were dressed and ready to go at 6 AM which is the time I was told Bill would be arriving. I set two alarms and we went to bed around 11 PM. It rained overnight and continued, off and on, this morning. We were up around 5:15 AM, got dressed, and had bagels and orange juice for breakfast but I did not make any coffee. Bill (our mechanic) was the first to show up at 6:45 AM. Since the lock was on the inside of the gate I walked over to make sure he could get it open. Just before 7 AM an ALSCO truck pulled in. There were two other ALSCO trucks in service bays and the driver walked over there, came back a short time later, and then drove away. Bill unlocked the office and then settled in at the outside picnic table. I realized pretty quickly that nothing was going to happen with our bus until John P. (Service Manager) showed up, but that was OK. It was a great comfort to be off the road in a safe place where we could sit for quite a while if needed and to know that there was a guy who had the skills and resources to fix our bus sitting were I could see him. We also had a good feeling about John D. (the owner). At 7:45 AM I received clearance to move the bus to the last service bay (farthest from the street) and by 8 AM had the engine running and the tag axle up. Action Mobile Service has seven service bays, only one of which (#1) is inside. The other six are under a large roof with open sides. (It’s a Florida thing; you won’t see that in Michigan.) They wanted me to back into the bay so I had to reposition the bus toward the passenger side, swing the nose to the left and into the entrance gate, straighten out, back down to the bay, and then swing the back end in on the passenger side. Linda spotted for me, as she always does, and Bill signaled the final positioning. Our coach at Action Mobile Service in Orlando, FL. awaiting the start of the driver side tag axle brake repair. We were told yesterday that we would not be able to stay in the coach while Bill worked on it, but Bill said we could. The difference was that because the tag axle can be lifted they did not need to jack up the bus. That made for a more comfortable day, both for us and for the cats, and allowed us to be more productive than if we had been confined to the customer lounge. I spent part of the morning in the customer lounge anyway as I was on the phone with Prevost Parts US in Elgin, Illinois. I spent most of the rest of the day interacting with Bill and the two Johns. Linda, however, was able to use her computer in the bus and work on tax returns. The brake was locked up to where Bill could not turn it by hand but he got the caliper off somehow and then removed the hub and rotor. I am always interested in how these things are done but figured that Bill, who did not know me, did not need me staring over his shoulder while he worked. 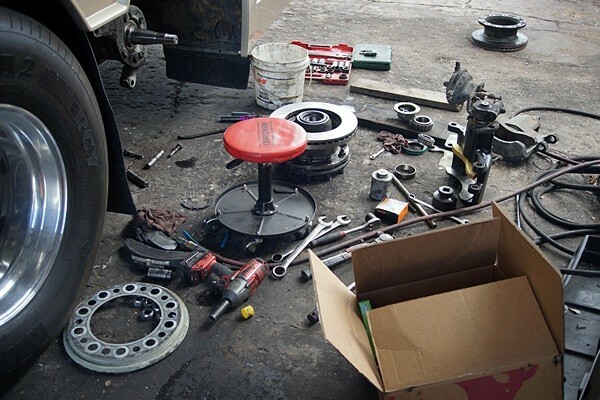 When he finally got everything apart he determined that the brake pads and rotor needed to be replaced, as did the wheel bearings, races, and seals. The major problem, however, was going to be the disc brake caliper. This is what a Prevost H3-40 tag axle looks like when it is completely disassembled. Action Mobile called in Rex from Rush Trucking, a huge national trucking company. Rex had a heavy duty truck parts business at one time but sold it and went to work for Rush. He had been in the heavy truck industry for over 30 years and had a lot of expertise and contacts. He looked at the situation and determined the part numbers for all of the parts Bill needed. A couple of hours later he showed up with everything, including a rebuilt/remanufactured caliper. The only thing he could not get was a new torque plate (spider). We could not determine if a new torque plate was needed but it was a possible cause of brake misalignment. If we were going to replace it, now was the time as it was completely accessible with the brake and axle hub removed. Gary at Prevost Parts had spent a lot of time with me during the morning and been especially helpful but I ended up talking to Wes to order the spider. It’s a phone bank and you usually have to take who you get as you cannot dial a specific person. You can leave a message and request a callback, but that can take a lot longer than waiting on hold for “…the next available representative.” They had a left hand spider in New Jersey and I ordered it for overnight delivery to Action Mobile. It is supposed to be here by 10:30 AM tomorrow morning. Without the spider Bill could not wrap up the job but he was able to spend the afternoon putting new seals and bearings into the axle hub and mounting the rotor to the hub. Once the spider arrives, and assuming it is the correct part, he figured it would take 90 minutes to put everything back together. The new rotor mounted on the hub (just behind the red stool, and the new caliper (upper right behind the cardboard box). John D. (the owner) said we could leave the bus in the bay overnight. We got to chatting and I gave him a tour of the inside. He noticed that we were not running a generator and asked if we were on an inverter. I confirmed that we were and he offered us the use of a 50 Amp RV outlet that was located by the passenger side rear of the service bay. It turned out that there was also potable water available if we needed it. I waited until Bill was done working at 3:30 PM, so as not to interfere with his work, and then got out the shorepower cord and plugged it in. We do OK on the inverter, and can use everything with the genset running, but the coach is definitely most comfortable and useful when plugged in to shorepower, especially “50 Amp” (240/120 VAC) service. Although it was warm today, the coach was partly shaded by the bay and we decided not to run the air-conditioners. With the windows and roof vents open, and the exhaust fans on, our small Duracraft portable fan was sufficient to keep Linda comfortable. By 5 PM everyone was done for the day and left, locking the gates on the way out. We had the lock code in case we needed to get out, or let emergency services in, but decided when we first arrived that we would not come and go unless absolutely necessary. I had a lengthy conversation with Chuck about the status of our brake repair and what I was finding out about Prevost and parts availability in the process. I also texted some part numbers to Butch so he could pursue possible sources in northern Indiana and southern Michigan. While I took care of those communications, Linda made salads and a potato lentil curry for dinner. After dinner I talked to Pat and Vickie for a while and then called Butch and had a long chat with him. Linda was watching (reading, CC) our Thursday evening CBS TV programs and when I concluded my call with Butch I settled in to watch TV with her and work on my blog posts for the last several days. I set alarms last night for 6:45 AM since Bill starts work at 7 AM and I told him yesterday we would be up and dressed by then and to not hesitate to work in/around our coach. I made a small pot of coffee and we had orange juice and bagels for breakfast which was made easier by the 50A RV electrical service that John D. had offered us late yesterday. There wasn’t much of anything Bill could do on our coach until the torque plate (disc brake caliper mounting spider) showed up. Linda worked at her computer while I worked on blog posts on my iPad. I eventually put aside my blog work and gathered up some of the boxes the new caliper and other parts were in. I texted Butch with various part numbers I had been given by Prevost, gotten off of used parts, or copied from labels on boxes. He called me just before 10 AM to let me know the number on the box label appeared to be the one we needed. He was in contact with someone at ABC Bus Parts in Muncie, Indiana who was in contact with someone at Meritor. The information he was getting was that the caliper was not available in stock but I could get it for $1,200 with a 45 – 60 day lead time. While I was glad to hear that might be the case, it certainly contradicted everything I had been told by Prevost, which I found a bit disturbing. The UPS truck showed up at 10 AM so I walked up to the office, retrieved the box, and took it back and set it by the driver side tag axle. I had just talked to Bill at little earlier but he wasn’t around at the moment. He still wasn’t around at 11 AM so I went to the office to see what was going on. As I suspected, Bill had to go out on a mobile service call. John D. (the owner) called Bill and then let me know that he would be back in about 10 minutes. I made sure everyone knew that I wasn’t trying to create an unnecessary since of urgency or priority for our coach, I just wanted to know what the status was. The new torque plate (spider) installed on the driver side tag axle. The new caliper is visible lower right. Action Mobile Service, Orlando, FL. When Bill returned he got right to work and in short order had the new spider mounted. He then installed the hub, the outer bearing, and axle seal. The hub gasket and cap were last, after which he added hub oil through the hole in the sight glass portion of the hub. It takes time for the oil to penetrate the bearings and settle so some patience is required to get the correct oil level. With the hub installed Bill now had to get the caliper in place. It’s both heavy and awkward to handle. It has to be lifted into place, lowered around the rotor, and secured with a pair of large steel slide pins. The problem is how to hold the caliper in place while getting the upper pin in place. In order to accomplish that he had another mechanic help him. 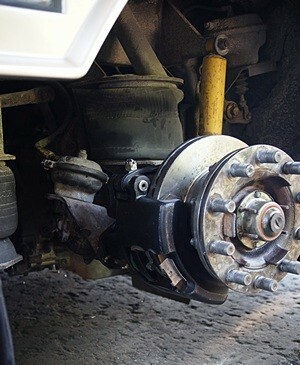 He then adjusted the automatic slack adjuster and finally reconnected the air line to the brake “can” (actuator). I left him alone until he was done and it was a relief to finally see that everything appeared to fit together. The hub spun with the minimum required drag, but we still had to test the installation. (The brake pads are always in contact with the rotor.) To do that I needed to apply and release the brakes but the tag axle was up (lifted) which cuts off the air supply to the brake chambers. Lowering the tag axle releases the air from the brake chamber that powers the lifting mechanism and at the same time allows air into the air springs that support the weight of the coach on the axle. It also changes one of the air valves so that application of the brake pedal allows air into the tag axle brake chambers. I could lower the tag axle, and probably apply the brakes once or twice, with the air stored in the system, but raising the axle back up, and/or additional application of the brakes, would require me to start the engine. That required a few minutes of my time so Bill decided to take his lunch break. The hub and rotor reinstalled along with the new caliper, ready for testing. Action Mobile Service, Orland, FL. While Bill was eating lunch I checked with the two Johns to see if Rex could supply me with another left (DS) caliper and two right (PS) calipers. They checked with him and he said he could have two of them this afternoon but could not get the third one until Monday. When Bill was done with lunch I started the engine and lowered the tag axle which caused the driver side rear to drop as the tag wheel/tire was not yet on the hub. When I applied the brakes Bill was not able to turn the hub and when I released the brake pedal he was able to turn the hub once again. That was the best test we could do with the bus sitting still and Bill was satisfied that the problem was properly repaired. Before Bill put the wheel/tire back on he climbed under the bus and greased the passenger side tag axle disc brake caliper. When he went to put the wheel back on the hub was too low. With the engine running I tried to raise the driver side rear using the Level Low system but it would not come up high enough. I tried lowering the front to pivot the tag higher but that did not work either. Bill found a length of 4″x4″ timber, put it in front of the outside driver side drive tire and had me move the bus forward just enough to roll the tire up onto it. That raised the tag axle hub enough that he could get the wheel onto the studs and secure it. As soon as it was on I moved the bus forward a little more until the drive tire was off of the 4×4. The tag axle brake problem was fixed. Bill greased the two front/steer disc brake calipers and then checked the oil level in both of those hubs and the passenger side tag axle hub. Now that I knew the disc brake caliper and spider fit and worked properly I let John D. know that I wanted the three additional calipers. He let Rex (Rush Trucking) know. We did not want to hang around Action Mobile in the bus until Monday and given that I would have to come back Monday in the car anyway I indicated that I would pick all three of them up then. I settled the bill for the repair work. The amount was substantial but I knew what it was going to be so it wasn’t a surprise. I also considered it fair and had no problem paying it. A little over 48 hours before we come dangerously close to having our bus catch on fire and if it had it would have been completely consumed. In the hours that followed we were faced with the very real prospect that we might not be able to get our bus repaired, effectively rendering it useless as a motorhome. We even half joked about buying a lot in an RV resort, moving the bus there (towing it if necessary), and becoming Florida residents. It was a real low point from which Action Mobile restored our plans and dream for a long, adventurous retirement using our motorcoach. As a separate transaction I paid a 50% deposit on the three brake calipers. At that point there was nothing left to do except say ‘thank you,’ hook up the car for towing, and leave, but not before calling Williston Crossings and making a reservation. Linda usually handles the reservation/registration process but with her hearing and voice issues that has become my job, at least temporarily, but hopefully not long-term. Sometimes we have to Ieave a message and get a callback, but Joann answered the phone this time. We had decided that we wanted to stay through Tuesday evening and depart on Wednesday morning April 13. To our surprise there was no pull-through site available for that set of dates. Site #439 was available, however, and was actually our 1st choice anyway as it is next door to our friends, John (Smiity) and Ali, and is the same site we were on for our entire winter here in 2014. I made the reservation, which was very easy as the resort still had our information on file. With our camping arrangements made Linda texted Smitty to let him know we were getting ready to head his way. I started the bus and pulled it out of the bay and around to the passenger side while Linda spotted for clearance to obstructions. I pulled up by the office, lined up with the gate, and shut off the engine. Meanwhile Linda brought the car up behind the bus and we connected it for towing. We checked that all the lights were working and were ready to go. We worked our way back the short distance to US-441 / Orange Blossom Trail via Satellite Blvd and the Central Florida Parkway. From there it was only a little over a mile north to get back to the entrance to FL-91 (Florida’s Turnpike). We had already studied the route on our iPad Maps app so we knew it was an easy interchange, with all turns to the right. As long as we stayed to the right we would end up northbound on the Turnpike towards I-75 and Ocala. Traffic on the Turnpike was not too bad but we did see an electronic information sign shortly after getting on advising of traffic congestion between the FL-301 exit and the I-75 merge. No surprise there, especially on a Friday afternoon. I rolled along initially at 62 MPH while Linda kept a close eye on the temperatures of the four wheels/tires that have disc brakes (steer and tag axles). The DS tag was running hotter than the other wheels by at least 10 degrees F, including the PS tag; not enough to indicate a problem, but given our recent experience and with no meaningful miles on the repair work, we were understandably nervous. I decided to error on the side of caution and travel at 55 MPH. Linda checked the temperatures every few minutes for the entire trip. The steer tires/wheels and the drive tires/wheels eventually settled in to temperatures in the mid-90 degree F range, plus or minus, while the tag tires settled in around 105 degrees F while free-wheeling and got as high as 120 after braking. The temperatures came back down, however, which was important, and the passenger side was sometimes higher than the driver side, which either meant the driver side was working or the passenger side was starting to fail. I preferred the former possibility to the later but it wasn’t like I had a choice. As we were warned, the traffic on the Turnpike slowed to stop-n-go conditions starting at the exit for FL-301. It remained congested, very slow, and often completely stopped all the way to the merge with I-75 northbound, where it got even worse (if that was possible). The volume of traffic trying to move north was as astounding as its lack of movement and remained heavy all the way to exit 354 at Ocala where we finally left I-75 and headed northwest on US-27 towards Williston. Linda had texted several status updates to Smitty and at 5:05 PM texted him again as we turned off of US-27 / Main Street onto NE 5th Street. I stopped at the turn into the resort and lifted the tag axle before proceeding around the corner. As I came around and pulled up to the gate Smitty was coming the other way in his golf cart. We said a quick ‘hello’ and he opened the gate. I pulled up by the office, which had closed just minutes before, so our bus/car combination was not blocking the incoming traffic lane and shut off the engine. We unhooked the car and Linda moved it to a temporary parking spot. John and I discussed how best to get me into the site. I expressed my preferred approach and he agreed to try it. I then followed him to the site where Linda was waiting for us. I learned a lot about how to maneuver this bus two years ago from ‘Big Bill’ Cowick when we were parked next to him and Nancy at Suncoast Designers in Hudson, Florida. Smitty got me positioned correctly to start backing up and watched the front end while Linda watched the rear end. I was able to back it up around the corner of an intersection and angle it towards the site, coming very close to a recently added street sign on the passenger side without hitting it. Once the right front corner was able to clear the sign I turned the steer tires to the left, tightening the turn as I went, while watching John, Linda, and the concrete pad in my mirrors and rearview camera. I backed the bus around smoothly onto the pad and then pulled forward once to make sure I was straight and the distance I wanted to be from the driver side edge of the pad. I then backed up to where the tag axle tires were still fully on the concrete pad with only a foot or so to spare. That positioned the bus conveniently for utility hookups while leaving plenty of space to open bay doors and lots of room on the passenger side where the patio area is located. It also created plenty of space in front of the bus for the car, getting it well clear of the road. Ali and John were already at Jeff and Kathy’s when John drove up to let us in. With the engine still running and the tag axles still up I checked that both tag axle tires spun freely. They did, which was very good news, so I lowered the tag axle, leveled the coach, and shut off the engine. I disconnected the chassis batteries, turned off the auxiliary air to the engine accessories, plugged in the shorepower cord, and made sure the auxiliary air-compressor was turned on. While I was taking care of all that Linda prepared a few things on the interior, opened windows and ceiling vents, and got a Yuengling lager out of the refrigerator and put it in an insulated cozy for me. It was time to relax and go be sociable at Jeff and Kathy’s 5th wheel. Everyone wanted to hear about our recent “adventure,” of course, and the telling of the tale fell to me. At some point my beer was gone so I walked back to our coach and opened our bottle of Nutura Carmenere, a red wine I picked up at Publix in Cocoa Beach along with a Nutura Merlot. It was not a brand we had tried before, and I had never heard of a Carmenere, but they were $11.99 per bottle wines on sale 2 for 1. We are always on the lookout for red wines that I like (not dry, no tannins) and are willing to risk $5 to $8 to try one. Not surprisingly, the Carmenere was drier than I like, but I was able to drink it and I got to show everyone one of our polycarbonate wine glasses. We stayed and chatted until 7 PM when everyone was finally hungry and we all returned to our coaches to have dinner. After dinner I sent a brief text message to four people just to let them know that we made it to Williston without any difficulties and that I would fill them in on details tomorrow. We were planning to go next door to John and Ali’s 5th wheel after dinner and sit around a campfire but we did not see them outside and we were very tired. I aimed the front TV antenna towards Gainesville and we found something to watch. Linda was off to bed before 10 PM and I was in bed by 11. It had been a long day and we were glad to have it behind us and be back at WCRVR. In spite of being very tired I stayed up late last night watching back-to-back episodes of Ken Burns’ JAZZ. Linda went to bed around 10 PM and I turned in at 12:45 AM. She was up at 7 AM and walked to the bath/laundry building to take a shower while I slept in until 8:30 AM. I was going to walk over and get a shower as well but Linda informed me that the water never got more than lukewarm. No thanks. I decided to hang out in my sweats for a while, made a pot of coffee, and worked on my blog posts for the past week. With all that has happened I have had quite a bit to write about. I plugged our WiFiRanger in last night and it did not have any difficulty connecting to the resort Wi-Fi system. The problem we seemed to be having this morning was that our devices will not stay connected to the WiFiRanger. Nuts. Linda needed to continue working on taxes and set her computer up on the desk. I have not taken my computer out of its case since I packed it up on Wednesday morning but I will have to get it out sometime soon. Our fresh water level finally dropped below 1/3 tank so I will need to hook up the water softener fairly soon but decided I would do the laundry and get a shower first. I gathered up all of the soiled clothes, towels, and some of the bedding, along with the tote bag of laundry supplies and the tote bag of shower supplies. I loaded everything into the car and drove to the north laundry/shower building, which is better equipped than the one near our site. It was noon. No one else was using the laundry so I used three of the washing machines closest to the dryers. These washing machines take about 25 minutes to run through their cycle so it was just over half an hour before all three loads were done. The dryers run for about 45 minutes, so once I had the laundry transferred to the dryers I took a shower. I then drove back to our coach, dropped off the shower supply bag, and we stripped the bed. I returned to the laundry building, washed the sheets, and transferred them to a dryer. As each dryer load finished I moved it to a large table and folded or hung it up. By 3 PM I had everything neatly packed back into the nylon mesh laundry bags and returned to our bus. Linda helped me get the laundry inside and put away. I then turned my attention to refilling our fresh water tank. That is a bit of a process as I have to get out the pre-filter, with hoses and pressure regulator attached, and the water softener, again with hoses attached. Heavy, bulky, awkward, etc. ; it’s my second least favorite RV chore, right behind checking tire pressures. I got everything connected and turned on the water supply. The connection at the supply faucet and the connection at the coach inlet both leaked badly. I snugged up the coach inlet connection so it didn’t spray water. It was still dripping quite a bit but it was good enough for filling the tank. I opened the fill valve, heard the water flowing into the tank, and opened the door to have a look. The remote gauge had dropped below the 1/3 tank level a day or so ago so all we could tell from the house systems panel was that we had less than 40 gallons in the tank. I had noticed this morning that we were not getting the usual flow of water to the toilet and Linda tried to use the kitchen faucet late this morning and got no water. Although I did not think we had used that much water we both made the (naïve) presumption that we had run the tank dry. To my surprise (not really), the tank was at the 1/4 level, which meant it still glad about 30 gallons of water in it. That seemed to suggest rather strongly that the problem was something connected to the water pump. Not good. I shut off the water and started grousing, because I find that it makes me feel better and is part of my problem-solving process. So does swearing a bit, so I did some of that too. Not like a sailor, of course; I was a USAF ROTC cadet years ago, after all. There were a few obvious things to check, after which I figured I would call Butch if they didn’t pan out. I got out my multi-meter and then looked up the circuit numbers for the water pump and switch circuits. I checked those circuits in the 12 VDC distribution panel and they all had +12.7 VDC which meant the fuses were OK. The power to the pump is switched through a relay so that the pump can be turned on/off from multiple locations using momentary contact switches. The easiest way to check the proper operation of the relay and confirm/deny the presence of power at the pump, was to disconnect the + 12 VDC and return wires from the pump and check for voltage on the supply wires. With the relay “off” there was no voltage present (a very small mV reading). With the relay “on” I had 12.7 VDC. Relay off, no voltage. That pretty much meant the water pump was down. While not a crisis situation, this failure, at this time, and on the heels of all of our other recent problems, was certainly unwelcome news (not that any failure at any time is ever welcomed). The only upside was that we were at a nice RV resort with full hookups, in a familiar location with relatively convenient access to resources, and in the company of friends. We had city water available, so we could use all of the systems on the coach that required fresh water, and we were scheduled to be here for four more nights, which meant I had time to deal with the problem, including getting parts shipped here if needed. My first instinct, however, was to try to get this fixed RIGHT NOW! I called Smitty to see if there was any place in town that sold RV parts. As I expected, he directed me to the local ACE Hardware store. I knew from previous visits that they carried some RV parts but were unlikely to have 12 VDC water pumps, and even less likely to have the exact model I wanted/needed. Linda did a Google search and located a Camping World store in Summerfield, Florida south of Ocala. Not that I was eager to go to Camping World, the home is “list price plus,” but if they had the right pump (or any pump) in stock I was feeling like it would be worth paying the premium to get it and have the problem resolved quickly. Unfortunately (or fortunately), it was already 4 PM and the store closed at 5 PM. There was no way I would make it in time, so I returned my attention to making the coach usable from the city water supply. In order to operate off of the city water supply we would need to leave the water turned on, and in order to do that I needed to get the connections to not leak. While I probably had replacement washers in one of my parts boxes, I decided to go to ACE Hardware for washers just on the chance that they might have an appropriate water pump. The only pump at ACE that would have worked was a 120 VAC unit and I was tempted to buy it. In fact, when I redo the water bay I will install redundant water pumps and I am seriously considering keeping the 12 VDC pump and making the second one a 120 VAC model. For now though, replacing the DC pump with an AC pump would involve more work than I wanted to get involved in. I did find what I was really looking for, however; garden hose washers. I bought two different kinds of flat washers, vinyl and rubber, and a pack of vinyl strainer washers. I should have also bought a roll of Teflon tape, but I did not think of it at the time. Back at our rig I realized that I was probably going to need Teflon tape. I was sure that I had some but it was not in any of my four tool boxes. Linda helped me empty out the car until we finally found the correct parts box. I replaced the strainer washer in the pressure regulator fitting that attaches to the water supply as the existing one was damaged and badly deformed. I also wrapped the supply faucet threads with Teflon tape before attaching the regulator to the faucet. With the output of the regulator valved off I turned on the water supply. Voilà; no leaks! The strainer is the first line of defense against particulate matter getting into the regulator and clogging it. When I redo the water bay, plan to set up the plumbing so that the supply water goes through a particle filter before going through a backflow preventer (check valve), an adjustable regulator, a water softener, and additional filters, all of which will be installed in the bay but easily accessed and serviced. I might even install an inline UV sanitizer. The only thing I will need to do to connect the coach to a water supply will be to connect a hose at both ends. Priceless. The other leak was at the fitting in the bay where the hose gets connected. These garden hose fittings are cheap, easily deformed, and prone to leak, and I think they are one of the other “weak links” in the materials and systems used to make RVs. (Sewer hoses and connectors are probably the worst, but that problem has been solved by Lippert Systems and I will be using their technology when I redo the utility bay.) Replacing the flat washer periodically is necessary routine maintenance but easily overlooked until a problem develops. I replaced the existing flat washer with one of the vinyl ones and then taped the threads on the (male) end of the hose with Teflon tape. I carefully threaded the two pieces together finger tight and then just a little tighter with a pair of slip pliers. (Over tightening actually deforms the washer and causes it to eventually leak.) I opened all of the intermediate shutoff valves and Voilà; again, no leaks! Our coach was now usable and we could leave the water on unless we were both going to be away from the coach for an extended time, when even a small leak could quickly become a big disaster. Time to relax. John and Ali were already down at Jeff and Kathy’s and Linda already had a Yuengling lager in an insulated cozy ready for me. We took some peanuts along and walked the short distance to their site to sit a spell and visit. Earlier in the day Jeff and Kathy had gotten a new dog and Kathy was out walking it. They lost their Yorkie, Teddy, to cancer back in December and were not really planning on getting another dog so soon but an elderly gentleman, who lives alone in the resort, had a 3-year old dog that he was no longer able to car for and needed to find a home for it. The dog’s name is “Mandy” and she is an 8 pound Dachshund / Miniature Poodle mix. She has a Dachshund body size/shape and face but a silver gray, slightly wiry coat unlike any Dachshund I have ever seen. She was friendly and sweet tempered and from all appearances she will settle in with Jeff and Kathy very easily. While dogs get strongly attached to their owners, they also respond quickly to the kindness of strangers. I think we were there for at least 90 minutes, perhaps two hours, before everyone got hungry and returned to their rigs for dinner. By that time it was already 7 PM and we were headed to John and Ali’s 5th wheel once we ate, so Linda made a quick, easy dinner consisting of a nice greens salad and Amy’s Asian Noodle frozen/microwaved entrées. After dinner I called Butch and brought him up to speed on our disc brake situation and told him about the water pump. He and I shared the opinion that it seemed like something might have happened with the +12 VDC power supply to the coach. Most of the house DC power circuits and systems, however, appeared to still be OK. He reminded me that we have an Amazon Prime account and could probably get a new pump delivered to the resort by Tuesday for a much better price than at Camping World. Roger that. I let him know that our current plan was to leave WCRVR Wednesday morning and arrive at their place in Twelve Mile, Indiana on Friday. He said we should go ahead and park and plug into the electrical power if they were not there as they would be setting up for a local hamfest that evening over at the county fairgrounds across the road from Bill Tharpe’s place in Mexico, Indiana. Been there, know how to find it. We walked next door to John and Ali’s around 8 PM and I took another Yuengling with me. It’s been that kind of week, I guess. They have an elevated propane firepit, conveniently located under their patio awning, and had chairs arranged around it in a conversational grouping. We sat and talked until 10 PM, when John had to make the rounds to close up certain buildings and check the gates. We continued to chat with Ali while John took care of his chores and he was back within 30 minutes. By 11 PM Linda was finally too tired to be sociable, went back to our coach, and went to bed. I stayed until almost midnight and finally left when I was yawning more than talking. I went to bed fairly directly and went right to sleep. We got up this morning when we were ready and not a minute sooner. I made coffee using the two new bags we bought at the Sunseed Co-op in Cocoa Beach. I requested pancakes for breakfast and Linda obliged by making some very good ones. Last night I was thinking about driving to Camping World in Summerfield, south of Ocala, today to buy a new water pump. The store opened at 11 AM and I figured I would find a pet supply store and buy some cat food while I was out. After Butch suggested last night that I could probably find the exact pump I needed through Amazon, I searched for it and he was right. I ordered it with four hours to spare to qualify for next day delivery with an $8 upcharge so I would have it on Monday. Standard Amazon Prime 2-day free delivery would have had it here on Tuesday, but I did not want to risk having it show up late in the day or worse, having the delivery truck get here after the office closed or not get here at all. I had hoped to spend some time at my computer working on the blog but the best I was able to do was get it turned on, connect it to the Internet, and download my e-mail, which I had not done since Wednesday morning. I was more than a bit surprised that I had over 80 MB of attachments! The bulk of that was several very large photo files from our daughter having to do with some recent projects our grand-daughter Katie was involved in. I called Chuck around 1 PM and caught him standing in line at a Cracker Barrel restaurant. We chatted briefly while he and Barb waited to be seated and I filled him in on the latest developments in the Prevost air disc brake saga. 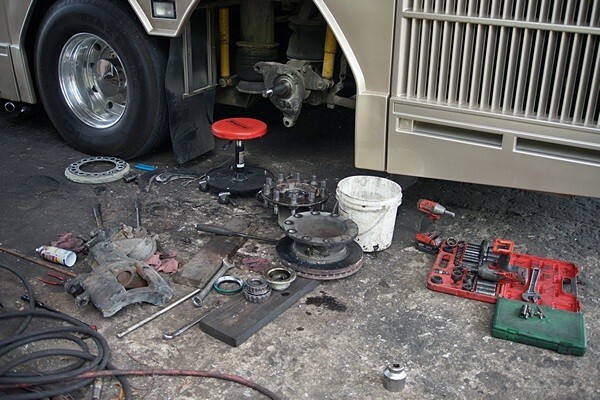 We had an early dinner after which we emptied out the car and the passenger side of the front bus bay to rearrange where things were stored and make room for the three new air disc brake calipers and the old one. Linda brought the bathroom scale out and we weighed the old one as best we could. I would have sworn it was 100 pounds but the scale said it was only 63 pounds. That was good as four of them would only put 250 pounds in the car instead of 300 to 400 pounds. We were able to repack the bus bay better and more quickly than I expected. We put smaller, lighter boxes back in the car, got our beverages, and walked down to Jeff and Kathy’s 5th wheel for happy hour. Jeff’s brother, Mark, was there and we learned that he lives in an apartment over by the Williston airport. Jeff made hamburgers for everyone (except us, of course) and we stuck around while they ate dinner. Jean showed up not long after everyone was done eating and joined the conversation. Smitty had to lock all of the gates at 5 PM so I rode along while he made his rounds. Linda and I left around 7:30 PM, as the light was just starting to fade, and went back to our coach. We had a light dinner/snack of pretzels and hummus and shared a very delicious orange. I called Butch and chatted briefly with him about the water pump and brakes and our revised travel plans. As things now stand we plan to leave here Wednesday morning and get to their place in Twelve Mile, Indiana sometime on Friday. At 8:15 PM we walked next door to John and Ali’s 5th wheel and sat around their propane firepit. Smitty had made popcorn with peanut oil and Hawaiian sea salt. Yum. John had to lock up the resort buildings at 10 PM. Linda and Ali were both tired and ready to go in for the night so I rode along with John. Once we were back we retired to our respective rigs for the evening. Linda was watching Elementary on TV so I picked up the story line in progress. When it was over at 11 PM we went to bed and went right to sleep. This entry was posted in beer, Bus Projects, Florida, Jetty Park CG, RV-Travel, WC-RV-Resort, WFPB, Wine and tagged 12V DC wiring (H3-40), Action Mobile Service (Orlando FL), ADB torque plate, Amazon Prime, Bill (Action Mobile Srvc Mechanic), Bill & Nancy Cowick, Butch Williams (MCI MC-9 NJT), campground showers, Cape Canaveral (FL), Carmenere red wine (Nutura), Chuck Spera (H3-40 Liberty), coach maneuvering, Cocoa Beach (FL), FL-528 (toll), FL-91 Florida Turnpike, FL-A1A, fresh water system (H3-40), high temp alarm (tires), I-75 (FL), I-75 Exit 354 (Ocala FL), JAZZ (Ken Burns PBS), Jeff & Kathy Sweeny (WCRVR), Jetty Park & Campground (Cape Canaveral FL), John (Smitty) Smith, John & Ali (Lang) Smith (WCRVR), John Douglass (Action Mobile Srvc Owner), John Provo (Action Mobile Srvc Mgr), JOSAM (Orlando FL), laundry, Mandy (the Sweeney's dog), NE 5th St (Williston FL), Orange Blossom Blvd / FL-441, Pat Lintner (GLCC/GLAMA), Prevost (Jacksonville FL), Prevost Parts US (Elgin IL), propane firepit (John & Ali), Rex (Rush Trucking Orlando FL), roadside assistance, shorewater connections (H3-40), Shur-Flo 4048 water pump (H3-40), Sunseed Food CO-OP (Cocoa Beach FL), tag axle brake (H3-40), Teddy (the Sweeney's dog), US-27 (FL), water pump (H3-40), WCRVR (FL), Williston (FL), Yuengling lager beer on 2016/04/10 by BRF. Neither of us slept as well as we would have liked last night. The outside temperature only dropped into the upper 60’s with high humidity and the interior of the coach stayed a bit warmer than that. Linda woke up and read from 2:30 to 3:30 AM; at least that’s what she told me this morning as I was unaware of it at the time. We both got up at 8 AM and enjoyed our first cup of coffee while iPadding and listening to Christmas music CDs. We bought an apple strudel at Publix last night that appeared to be vegan and had some of it for breakfast with our second cup of coffee. It wasn’t great strudel, but it was still a treat. All-in-all it was not a bad way to start Christmas Eve day. Williston Crossings RV Resort, and many of its residents and temporary guests, have been in the holiday spirit since we arrived here on the 1st of the month. Red and green laser “starlight” projectors are in widespread use at night and many sites have decorated their street light and/or RV with lights while some have put up more substantial decorations. Most notable, however, are the golf carts, many of which are decorated for the season. Most folks here wave as they pass whether driving their car or golf cart, riding a bike, or just walking, but based on our prior experience this is normal so I cannot say that folks are in a friendlier spirit than usual for the holiday. There is, however, a fair amount of “Merry Christmas” being passed around and I think it reflects the fact that most folks are glad to be here even with the record heat. I had an unfinished chore list from yesterday but wasn’t really in the humor to work on those items on Christmas Eve and do not intend to work on them tomorrow either. One of the side gaskets I our entry door window came out again yesterday, however, so I will have to fix that again and do so soon, certainly before we leave for Arcadia. Linda went for her solo morning walk at 10:15 AM and I settled in to work at my computer. I was determined to make headway with uploading blog posts but first I wanted to dispatch the article for Bus Conversion Magazine on the installation of the ITR Oasis Combi diesel-fueled hydronic heating system in Butch and Fonda Williams’ MCI MC-9 NJT. Butch had made a number of good edits that filled in missing details so I incorporated all of them and rewrote a few sentences in my own voice. I then moved all of the photos for the print version of the article “in line” with the text and changed the format to 2-column. I even figured out how to get the text to wrap around the vertical photos to get a better idea of how many pages the article will take. I completed this work around 12:30 PM and uploaded it to the BCM proofreading folder in my Dropbox. I also updated my article status tracking spreadsheet and uploaded that to the Dropbox. I moved the files on my computer from the Out-For-Review folder to the Proofreading folder and mirrored that on the NAS. I then e-mailed BCM publisher Gary Hatt to let him know the article was there and ready for review. Linda got back from her walk and made sandwiches for lunch with mock deli slices (vegan), Daiya non-dairy cheese slices, and lots of greens. We ate outside as the temperature in the coach was 89.something degrees F. She stayed outside in the shade and read but I went back inside to work on blog posts. I was not really uncomfortable, as I was not exerting myself physically, but knew we would have an uncomfortable night if we did not cool off the coach. When Linda came back inside we closed up the coach and turned on two of the three air-conditioners. I worked the rest of the afternoon on my blog, editing and then uploading seven posts covering September 1 through 7. For dinner we had the leftover pizza from last night’s visit to Satchel’s. We managed to get six dinner meals out of our three visits which is 25% of our dinners for the first 24 days of December. At dinner last night we suggested to John that it might be nice to have a special campfire on Christmas Eve. He liked the idea and said he would check with Bob (the resort manager) and take care of it if he got the green light. Linda packed some wine and we walked down to the firepit at 6:30 PM. Long before we got to the firepit we could see there was no fire. In fact, there wasn’t anyone there. We noticed golf carts at Jeff and Kathy’s site nearby, including John and Ali’s, so we walked over there. We found Ali, along with three other folks, but not John. It turned out that John was ill with some sort of gastrointestinal ailment and there was not going to be a special Christmas Eve fire. There were enough empty chairs for us to have a seat so we stuck around for a while to chat and enjoy a small glass of wine. Kathy got a Samsung Galaxy Tab 3 Lite for her grandson Spencer and asked me if I would get it set up for him. I did this two years ago and agreed to try again. Spencer is arriving tomorrow afternoon with his family and Kathy was hoping to have the tablet set up so he can use it right away. I got a pair of text messages from my long-time friend, J. C. Armbruster, wishing me a happy Christmas Eve and inquiring as to our whereabouts. I did not have my glasses or stylus with me so I deferred replying until we got back to our rig. When we returned we found a large box sitting on our entry stepstool. Linda checked the label and it was definitely addressed to us. The office closed at 1 PM today and there wasn’t anything there for us when Linda checked around noon, so it must have arrived later. Someone in the office must have figured it was Christmas gifts and brought it to our site, which they do not normally do. Linda opened it enough to confirm that it was, indeed, gifts from Brendan, Shawna, and Madeline and then set it aside for tomorrow. I replied to the text message from J. C. (which sounds a little bizarre on Christmas Eve). I then spent an hour trying to configure the Samsung Galaxy Tab 3 without success. I thought the problem was Wi-Fi related as the tablet did not have any difficulty connecting to the resort Wi-Fi system and obtaining an IP address but it never opened a browser window where I could enter the username and password to get through the resort’s filter and out to the Internet. I turned on the guest network on our WiFi Ranger without a password and tried connecting to that as the WFR was already logged in, but it still did not work. I tried creating a Samsung account but the screen just said “…processing” and the little icon just kept spinning. I also tried entering Spencer’s Gmail address and password(s) that Kathy gave me but the device could not connect to Google. It’s possible that the problem was simply an incorrect e-mail address and/or password but the error message I kept getting said the tablet could not establish a connection to the remote server. That sounded like an Internet access issue to me. I also tried resetting the device to factory defaults but the instructions for doing that apparently assumed (required?) that the device had already been set up correctly and activated. I cleaned the screen and packed everything back into the box. I will return it to Kathy in the morning. Perhaps John will be feeling better and can get it to work. When I picked up the screen cleaner it was wet. It was sitting on the desk under the air intake for the middle air-conditioner which is on the bottom of the cabinet. I shut that A-C off, moved the electronics and paper that were sitting there, and wiped up the small amount of water. Apparently the drain line for the drip pan is clogged so I will have to add that to my list of bus chores. We were tired of listening to the air-conditioning but it was warm in the bedroom so I turned on the third A-C to cool it down. Before turning in for the night I turned the fan to a slower speed and tried adjusting the thermostat, as it had gotten rather chilly. This entry was posted in BCM, Family-Friends-Home, Florida, RV-Travel, WC-RV-Resort and tagged A-C evaporator (H3-40 kitchen), BCM articles, Butch Williams (MCI MC-9 NJT), Carrier split A-C units (H3-40), Christmas Eve, Guest Network (WFR-MT), Holiday decorations, ITR Oasis Combi article (BCM), J. C. Armbruster (Olympia WA), Jeff & Kathy Sweeny (WCRVR), John (Smitty) Smith, mock deli slices (vegan), Oasis hydronic diesel furnace (ITR), Samsung Galaxy Tab 3 Lite tablet, Satchel's (Gainesville), vegan pizza, WCRVR (FL), WCRVR firepit, WiFi Ranger Mobile Ti on 2015/12/24 by BRF. It rained off and on all night with a heavy downpour around 5:30 AM. Once again we did not close up the coach and run the air-conditioners so the bedding was a bit damp, but we slept through the night and did not get up until after 8 AM. I took care of the cat chores and then made a full pot of coffee. We used our iPads, as we do almost every morning, while we enjoyed our morning brew and finally had half of a grapefruit (each) for breakfast around 9:30. It was in the upper 60’s when I got up but was forecast to drop to 55 degrees F by dinner time and into the upper 30’s overnight. Burrr. I took a few pictures yesterday at the Breezy Oaks Music Jam so my first task today was to copy those to my computer and back them up to the NAS. I then continued working on selecting and processing photos for blog posts and spent most of the rest of the day doing just that except for some time out for lunch, a mid-afternoon stroll, and dinner. Today was our younger grand-daughter’s third birthday. Our daughter and son-in-law went to our son and daughter-in-law’s house this evening for Madeline’s birthday and Linda arranged for us to Facetime while they were all there. We initiated the call at 6:35 PM and Facetimed for almost 30 minutes. We got to see Madeline open the gifts we bought for her and interact with her and everyone else. We had closed up the windows and changed into warmer clothes for the fire circle before we made the Facetime call so as soon as we were done with “happy birthday” we got our sweatshirts and wine supplies and headed for the firepit. There were already folks there but there were also empty seats, the cooler weather keeping some folks away (which made no sense to us; it’s a FIREpit after all). John was tending the fire but Ali was not there yet. Tom and Cindy were there and I took the open chair next to Tom. We were at the campfire until 10 PM when John had to go lock up and Ali was ready to go in for the night. I spread out the remaining fire logs and then we walked back to our bus in the cool night air. The temperature in the coach was 74 when we left and had dropped to 70 by the time we returned. We both changed into our warmer lounging clothes (sweats), turned on the TV, and nibbled on pretzels and hummus. Linda trundled off to bed around 11:30 PM but I stayed up a bit longer. I checked e-mail and had one from Technomadia about their latest Mobile Internet Aficionados report on mobile cellular boosters. I logged in to read it and discovered that our MIA membership had expired in August so I renewed it online. I read the report and then went to bed where I wrote briefly on my iPad. The outside temperature had already dropped to 45 degrees F but Linda had turned on the electric heater pad on my side of the bed before going to sleep so it was nice and toasty. The overnight low was forecast to drop to 36 degrees which meant the inside temperature would drop to around 60; not freezing cold, but chilly enough that we would need the furnace for a while in the morning. I went to sleep around 12:30 AM. This entry was posted in Computers, Digital Image Processesing, Family-Friends-Home, Florida, RV-Travel, WC-RV-Resort, Weather and tagged 3rd birthday (MEF3), bed heater pad (H3-40), cool and humid, Facetime (iPad), heavy rain, hummus and pretzels (vegan), John (Smitty) Smith, John & Ali, Madeline (MEF3), Mobile Internet Aficionados (Technomadia), RV Internet Resource Center (Technomadia), Tom & Cindy (WCRVR), WCRVR firepit, website/blog on 2015/12/18 by BRF. I was awake before 7 AM but did not get up until 7:15. I removed and cleaned my nighttime bite guard, as I do every morning. I then cleaned the cats’ food bowls and filled them with fresh food. Linda was still sound asleep so I worked at my computer for a while selecting and processing photographs for blog posts. I finished my selections for August and was part way through September when Linda got up so I put that work aside and made our morning coffee. We both worked on our iPads for an hour doing our usual morning things. Linda texted John (Smitty) regarding going to Satchel’s this evening for dinner and I messaged our daughter regarding Facetiming with everyone on Friday, which is grand-daughter Madeline’s 3rd birthday. Linda proofread our 2015 Year in Review holiday letter and found a few things that needed to be corrected. For breakfast we had granola with fresh blueberries, orange/grapefruit juice, and split a banana. After breakfast Linda got dressed and I took a quick shower (she took one yesterday.) I was going to use the bathhouse but decided to shower in our coach to use up more of the remaining fresh water and get it into our gray tank. The fresh water level dropped below 1/3rd yesterday which meant we still had 40 gallons, easily enough for two more days with a little reserve. I got dressed and we dealt with a few chores. Linda vacuumed the inside of the coach, which she had not done since we left Michigan. I dumped our holding tanks and filled our fresh water tank and updated our water usage spreadsheet. I calculated our fresh water usage and waste water generation for this past winter. Over 128 days we averaged just over 13 gallons of fresh water per day and over 120 days generated an average of just over 15 gallons per day of waste. Those numbers suggest that a 130 gallon fresh water tank and a single 150 gallon waste tank would be well balanced and allow us to boondock for 10 days with some reserve. That’s only 280 gallons total, 40 gallons less than the 320 gallons (approximately) of the three tanks currently in the bus, so tanks that size would create the space I need in the bay for a water softener, filters, and fresh hose reel, and possibly a shorepower cord reel. When we pay more careful attention to water management and conservation we can reduce our fresh water usage to 10 gallons per day with a corresponding reduction in waste generation. That would allow us to boondock for 13 days. With slightly larger tanks we could stay out 14 days and still have room for the things I want to get into the bay. Final decisions will depend on more precise calculations and the actual dimensions of possible equipment. With the chores done (for now) Linda started addressing envelopes and putting postage on them while I made final changes to our holiday letter and started printing copies. She folded the letters, stuffed them into the envelopes, and sealed them. It took about two hours to get 34 letters ready to mail. We skipped lunch and just had a few pretzels. We wanted to stop at Walmart on our way to Satchel’s so we left at 2:45 PM and drove to the Williston post office, sent the letters on their way, and headed to Gainesville. John and Ali followed later in their own car. At Walmart we found Christmas cards for mailing checks to immediate family members. I got two pairs of shorts, as I forgot to pack mine when we left home, and we picked up two bags of Snyder`s sourdough pretzel nibblers. I also got a call from Pat Lintner. We chatted briefly and I said I would call him back when we got hone after dinner. We were at Satchel’s by 5 PM and sat inside. We had the same selections as last time: small salad and medium pizza with Daiya mozzarella cheese, onions, mushrooms, and sun-dried tomatoes. We only ate half the pizza and brought the rest home. This pizza is soooo good. It’s one of the best we have ever had, including all of the non-vegan pizzas we have eaten over our lifetime. Only the original Luigi’s Pizza from St. Louis in the 1960’s stands taller in our memories, although the current Imo’s chain makes a similar and very good pizza. We were back at our coach by 6:45 PM and went for an evening stroll to help settle our dinner. It was cool but humid and the clouds had cleared out so a pleasant enough evening for a walk. When we got back to our coach I called Pat and we talked for about 40 minutes with Vickie occasionally joining in on the other end of the call. They are not leaving Indiana until after Christmas and will spend New Year’s Eve at an RV park near Ocala, Florida as they have every year for many years. They will be less than 40 miles from Williston at that point but we will already be in Arcadia by then. Timing is everything. Some nights I just do not feel like working at my computer, or iPad, or reading, and tonight was one of those nights. Unfortunately Wednesday evening is a bit of a TV wasteland, even on PBS, which is to say there wasn’t anything on that interested me. The best thing on was a Big Band retrospective on PBS but it was also part of the 24/7 fundraising that has become the network’s defining characteristic. Whatever the reason, the music did not grab me the way it normally would. CBS had a 3-hour Survivor finale. Nope, not going to watch that. Linda read and I scrolled through channels hoping something interesting would pop up but eventually I zoned out. Even Ask This Old House (AskTOH) was less interesting than usual. I guess I just wasn’t in the mood. It happens sometimes. This entry was posted in Family-Friends-Home, Florida, PBS, Restaurants, RV-Travel, WC-RV-Resort, WordPress and tagged domestic water usage (H3-40), John (Smitty) Smith, John & Ali Smith (WCRVR), Meghan (MEF2), Pat Lintner (GLCC/GLAMA), Satchel's (Gainesville), utility bay (H3-40), veggie pizza (vegan), Walmart (Gainesville FL), website/blog, Year-In-Review letter (2015) on 2015/12/16 by BRF. I got out of bed at 8 AM, fed the cats, refreshed their water, and cleaned their litter tray. I made some hot soapy water for dishes and then measured out and ground our morning coffee beans. Once I had the coffee brewing I cleaned the grinder, which I had not done in a while. Linda got up around 8:30 and we both sat with our iPads and enjoyed our first cup of coffee. I had a reply to the e-mail I sent our son last night and replied back. I also sent the photo I created on Thursday to him and our daughter. It is a 3-image panorama looking north out of our passenger side living room window of our motorcoach. At 9:30 Linda started making pancakes, which has become something of a regular treat for our Sunday breakfast. I got a call from my sister at 10 letting me know she was heading to the hospital where our dad is in the ICU. We finished our coffee around 10:30 and got dressed. Linda settled in to work on her counted cross-stitch project and I checked our fresh water tank. The level was finally below 1/3 on the monitor so I decided to test the park water. As I expected, based on our previous time here, the hardness was at the maximum on the test strip so I got the water softener out and connected it to the supply valve. The quick disconnect, while a nice idea, is made of plastic. It was finally worn to the point where it would not seal so I unthreaded it from the pressure regulator and put it back in the fresh water tub where it joined a dozen other components that I should throw away. Someday. I have read in multiple publications and blogs that the RV sewer hose, and especially the bayonet connectors used on RV sewer hoses, is the weakest component on an RV, both by design and manufacture. While these components may be in contention for that status, I submit that the garden hose fittings that are universally used for the fresh water connections may actually be the worst. My fresh water connections always leak even when I tighten them (gently) with a wrench. My sewer connections do not generally leak. But I have digressed once again. When I had the softener connected I tested the output and it appeared to be fully charged so I connected it to the inlet of the coach and refilled the fresh water tank. In Quartzsite, Arizona this past winter I kept track of the details of when I dumped and filled tanks, including the hardness was of the water coming out of the softener before and after each fill. This data served two purposes. One purpose was to compensate for our waste tank level monitors, which do not work. We were trying to determine the rate at which we were filling them so we could calibrate how long we could reasonably boondock before we had to dump them. That turned out to be about nine days, conservatively, which is how long we went before hooked up here and dumped. Because the water softener can only remove a certain number of grains of hardness before it is exhausted the number of gallons it can soften before it has to be recharged depends on the hardness of the water coming in. At 25 grains of hardness per gallon, which is what we had in Q and what we have here in Williston, the softener, which has a capacity of about 10,000 grains, can process about 400 gallons. If the hardness is higher than 25 gpg we will not be able to process that many gallons. 400 gallons is about four refills if I refill it when the level is down to 1/6 (20 gallons). Our usage data from Q indicated that we used about 9 gallons per person per day on average (18 gallons per day) and that I was filling the tank every 5 to 6 days and recharging it every three weeks. While setting up the water softener I noticed an active nest of red ants. I saw John drive by and a few minutes later saw him headed back our way and flagged him down. He did not have the ant poison on his cart but offered to get it and come back, which he did. He also brought a rake. It turned out that he buys this product at his own expense and uses it to treat sites before folks check in, so I will buy a bag for ourselves and one to replenish his stock as part of my trip to Hudson tomorrow. With the refill underway I resumed working on the photos for the BCM article on the International Thermal Research (ITR) OASIS Combi hydronic heating system in Butch and Fonda Willams’ 1987 MCI MC-9 NJT bus conversion. The hospital tried to reach me at 12:14 PM but the call went directly to my voice mail. After a few text messages back and forth with my sister and niece I received a phone number for the doctor and was able to get her on the phone. Brendan texted me at 1 PM to let me know he was headed to our house. He called when he got there and I called him back on our house phone. He spent about half an hour searching through brief cases looking for certain papers and telling me what he was finding. He found the case I needed and took it back to his house where he can go through it more comfortably and ship it to me if needed. I had resumed working on the BCM article when John and Ali showed up. We invited them into the coach to see the remodeling work we have done and they stayed long enough to chat awhile and have a small glass of wine. I opened the bottle of Viva La Rojo from the Heart Of The Desert winery in Alamogordo, New Mexico and we all agreed it was very nice. It is at such moments that I am left to wonder why we did not buy more than one bottle. After they left I continued working on the article until I was too tired to concentrate. It was well into the second half of the afternoon so we both put our projects aside and removed the fogged living room awning style window/frame, wrapped it in a blanket, and put it in the car. I need to leave early in the morning and drive to Suncoast Designers in Hudson to have the window repaired and did not want to be messing around with it at 6 AM in the morning. Getting the window out required the step ladder and a small screwdriver to remove two C-clips so it was a bit more involved than it sounds. Linda put the screen back in place, covered it with a piece of the silvered bubble insulation, and taped it around the edges. The RV resort is very safe so someone getting into our rig was not our concern. Rather, the low temperature overnight Monday into Tuesday is forecast to be in the 40’s so we really cannot have an uninsulated opening in the side of the coach. The chance for rain is low to zero, and we have the awning out over most of that window, so we are hopeful we will not have to seal the outside with plastic. Our other concern was our cats. The screens do not fit as tight as we would like and if this one fell out the cats could jump to their “freedom” with potentially dire consequences. Linda made stuffed Poblano peppers for dinner. The preparation took a while so I laid down on the sofa and watched Martha Bakes and Ask This Old House on the Create channel from the University of Florida, Gainesville PBS station. What can I say? I find TV that teaches me things entertaining, even if I can’t eat anything Martha bakes. At home Linda would normally cook the peppers on our outdoor or indoor grill but tonight she pan-seared them. The peppers were stuffed with a mixture of rice, black beans, tomatoes, scallions, vegan cheddar cheese, and vegan sour cream. The peppers brought just enough heat to the dish and we finished the bottle of Viva La Rojo, which smoothed everything out. We had a nice salad with sun-dried tomato vinaigrette as a first course. We had sliced fresh strawberries for dessert. It was a really good meal. We watched President Obama’s address to the nation from the Oval Office, an interesting episode of 60 Minutes (which I have not seen in years), and the Sinatra 100 Grammy tribute. It was an unusual evening of television for us but very enjoyable and a nice conclusion to a day that was broken up into multiple threads. This entry was posted in BCM, Bus Projects, Family-Friends-Home, Florida, Medical-Dental, PBS, RV-Travel, WC-RV-Resort, WFPB, Wine and tagged Brendan, Bruce's dad, Butch & Fonda Williams, Butch Williams (MCI MC-9 NJT), counted cross-stitch (Linda), domestic water usage (H3-40), fogged window (H3-40), fresh water tank, ITR Oasis Combi article (BCM), John (Smitty) Smith, John & Ali Smith (WCRVR), Meghan (MEF2), pancakes (vegan), Patty Fay, PBS (Gainesville FL), President Obama, red ants (WCRVR), stuffed poblano pepper (WFPB), Suncoast Designers (Hudson FL), Viva La Roja (Heart of the Desert), waste tank level monitor (H3-40), water hardness, water softener (H3-40) on 2015/12/06 by BRF. I am really glad that I installed the Feedly app on our iPads and figured out how to use it. I enjoy starting most days with our freshly ground and brewed special blend coffees from Teeko’s (Howell, MI) while I easily read any new content on the nine or so blogs that I follow. I also subscribe to our blog, which makes it easy to check on how our posts appear on an iPad. Sometimes I catch typos and I can log in to WordPress from the iPad and fix them. We got an e-mail yesterday from the Escapees RV Club reminding us that April 6 was the last day to order polo shirts for the upcoming Escapade. Apparently we missed the original announcements (we get a LOT of e-mail and do not always read the commercial messages carefully). We followed the link to the special website and ordered one for each of us to pick up when we check in at the rally next month. It’s always nice to have a new polo shirt, especially one that clearly identifies us as RVers. The other reason to order is that I prefer a pocket for my eyeglasses and the pocket shirts are only available pre-order. We also experienced at the Escapade last July that the limited stock of available shirts sold out very quickly. As long as we were doing RV-related things online we registered for the FMCA Great Lakes Area Motor Coach Association area rally in June. GLAMARAMA14 will be the second area rally hosted by GLAMA. The first one was last September and two versions of an article I wrote about the event were published. One version appeared in the newsletter of the FMCA Great Lakes Converted Coaches (GLCC) chapter. The other version was the cover story in the January 2014 issue of Bus Conversion Magazine. We will once again be parked with our GLCC chapter. While Linda went to Gainesville for some specialized grocery items I worked on e-mail and RVillage stuff and then finished/uploaded my blog post for yesterday. I was reading the Harvest Hosts April newsletter and decided to see if Don and Kim had joined RVillage. They had, and had already created a Harvest Hosts Group! We joined the group and sent them a friend request, which they accepted. I had an e-mail from Chuck indicating that he might have a problem with the Vanner Equalizer on their Prevost H3-40 chassis batteries and wondering if I knew where it was located? On the drive up from Pelican Lake in Naples, Florida to the Prevost Community rally at LazyDays RV in Seffner, Florida they got a telltale light indicating the upper and lower halves of the 24 VDC chassis battery bank were out-of-balance. It just so happened that I did know where the equalizer is located, but only because I had stumbled on it while servicing our chassis batteries not long after we got the coach. (It is mounted on the underside of the chassis battery tray or the adjacent chassis electrical disconnect tray.) I sent him the info and he called later to chat. We are already thinking about what we have to do to be ready to leave on Monday. I shut of the fuel polishing module and removed the paper towel I had wrapped around the check valve last weekend to absorb fuel from the tiny leak. Polishing is just a term for “finely filtered.” The pump ran continuously for about six days, long enough to slowly filter most of the fuel in the tank at least once. The fuel polishing module draws about two (2) gallons per hour from the main diesel fuel tank through the pickup tube that supplies the Aqua-Hot, pumps it through the dedicated Racor water separator/filter for the Aqua-Hot, and returns it to the tank. Because the fuel is moved through the filter so slowly it is better able to remove any moisture, debris, and organisms that may be in the fuel. We came in to WCRVR January 1st with a nearly full fuel tank, so the FPM needed at least four days to filter the 200 gallons we had on board. Of course, we have used the Aqua-Hot while we were here and also run the main engine, both of which circulate fuel through Racor water separator/filters, but not so slowly as the FPM. The pickup tube for the Aqua-Hot (and the one for the auxiliary powerplant) are (supposed to be) only 3/4 of the way into the tank (from the top) to prevent them from using all of the fuel in the tank. (We have a practical range of 200 miles on a 1/4 tank of fuel with a comfortable reserve; 250 miles if absolutely necessary. At 300 miles we would risk running out of fuel. That would not be good and require the engine to be re-primed once we had fuel on board.) The main engine pickup tube, however, is near the bottom of the tank, so running the main engine also has the effect drawing the fuel from the bottom 1/4 of the tank and returning it to the top, thus mixing all of the fuel. I had disconnected the water softener yesterday so AALL*BRITE could use the water supply to wash our coach. One of my last chores before pulling out will be to dump the waste tanks and top off the fresh water tank so I reconnected the water softener in preparation for this task. We gathered at Jack and Silvia’s site at 4 PM for happy hour along with John and Ali, Doug and Paulette, and Jeff and Kathy. We enjoyed a glass of the Barefoot Moscato that Jeff and Kathy gave us last night as a “thank you” for helping with the electrical issues in their motorhome. We also had a chance to chat with Paulette more than we have up to this point. By 5:30 PM we were all getting hungry and returned to our respective rigs for dinner. Linda made Cauli-power Fettuccini Alfredo for dinner using a recipe that replaces the traditional cream-based Alfredo sauce with a sauce made from cauliflower. She had not made this dish before and had to substitute angel hair pasta for the fettuccini. It was very tasty. In addition to Sloppy Joe’s she is making Itty Bitty Carrot Cake Cookies for tomorrow’s pot luck dinner. The cookie recipe calls for rehydrated raisins that have soaked overnight in water, so she had to get that started today. Tonight was the last campfire we will attend at Williston Crossings RV Resort as we are scheduled to leave on Monday. The highs have been reaching into the mid-80’s, the lows only into the upper 50’s, and it has stayed light much later due to the switch to Daylight Savings Time and the steady advance of spring. These factors work against the appropriateness of a large fire and at some point, perhaps soon, WCRVR will stop having the Friday/Saturday night campfires until next fall when the long-term seasonal residents return. That won’t keep people from gathering at the fire pit to hear Smitty, Jeff, and others who might drop by, play their guitars and sing their songs. Alas, we will not be among those retuning. As is clear from my many blog posts over the last three months we have enjoyed our stay at Williston Crossings and would not hesitate to come back here. Indeed, we recommend the resort without reservation to anyone visiting this part of Florida. But we are at the beginning of a journey in which we hope to explore and experience many places in North America over the next 20 or so years. There are too many unvisited places for us to return to one so soon, if ever, no matter how nice it is. This entry was posted in Family-Friends-Home, RV-Travel, WC-RV-Resort, WFPB and tagged Aqua Hot, Bus Conversion Magazine, campfire music, Cauli-power Fettuccini Alfredo (WFPB), Chuck & Barbara, Don & Kim Greene (HH), Doug & Paulette (ON), Earth Origins organic markets, Escapade 2014, Escapade polo shirts, Escapees RV Club, Feedly, FMCA, FPM-50, Gainesville (FL), GLAMA, GLAMARAMA14, GLCC newsletter, happy hour, Harvest Hosts, iPads, Itty Bitty Carrot Cake Cookies (WFPB), Jack & Silvia, Jeff & Kathy, John (Smitty) Smith, John & Ali, Moscato (Barefoot), Prevost H3-40, Racor water separator-filter, RVillage, Sloppy Joes (WFPB), Teeko's Coffes & Teas (Howell MI), Textured Vegetable Protein (TVP), Vanner battery equalizer, water softener, WCRVR firepit, WFPB, WordPress on 2014/04/05 by BRF.